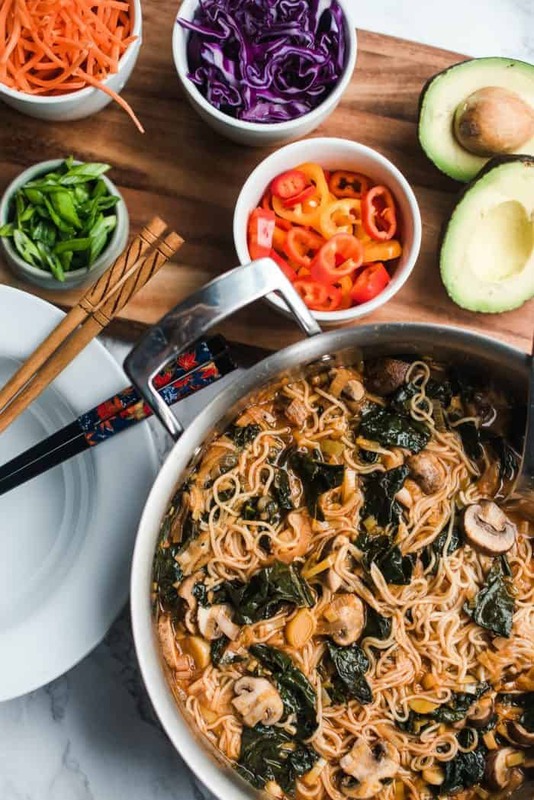 This tasty comfort meal, Vegetarian Ramen Noodle Bowl, is our favorite ramen noodle bowl recipe. 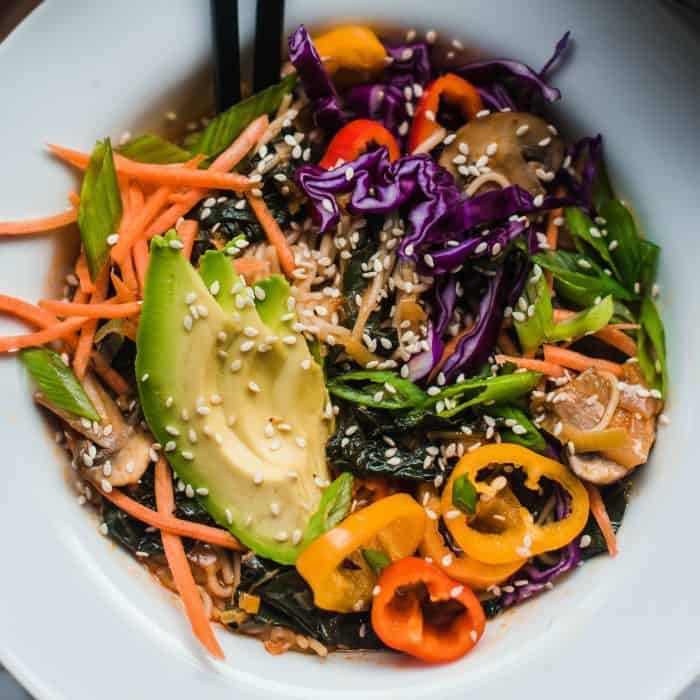 If you love a good Asian noodle bowl, then add fresh cabbage, avocado, peppers, carrot, sesame seed, with cilantro and green onion for the perfect toppings! Serve hot and enjoy with your favorite friend! Friends, I don’t know what it is about soup or noodle bowls that makes me think of “slowing down.” Maybe it’s because the cooking process is actually slow, which for me means I get to sit, linger, and then enjoy the finished product. Or, maybe it’s because it took time to make, it’s hot, and you get to sip or savor, and just eat slowly. This is great for lunch. 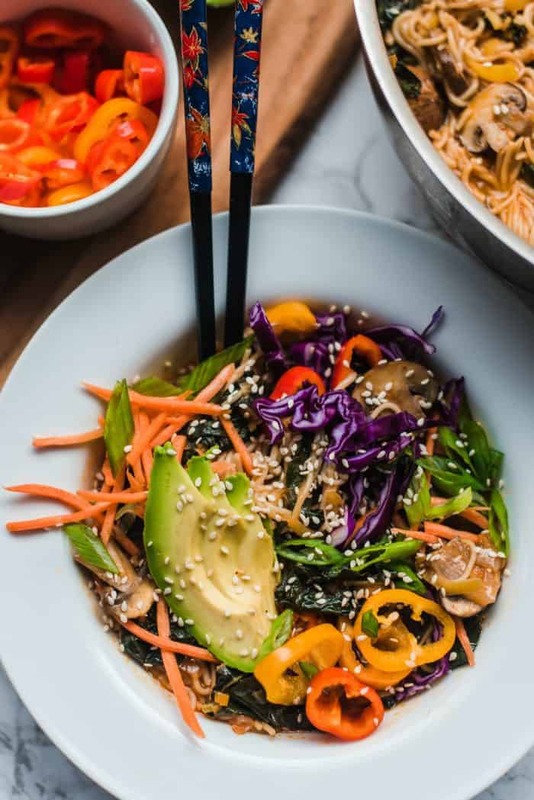 If you’re looking for a noodle bowl for dinner, and love salmon like we do, try this Coconut Salmon Zucchini Noodle Bowl Recipe! Or this low-cab Noodleless Zucchini Chicken Bowl Recipe! 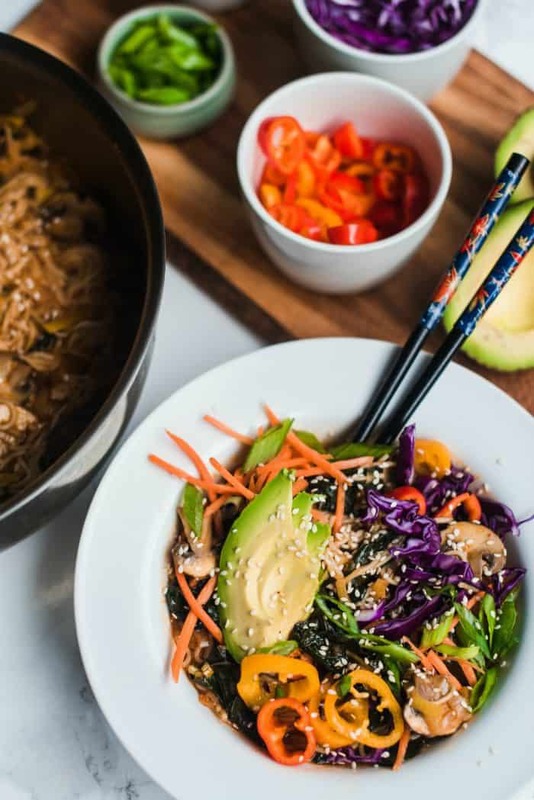 Enjoying a meal like this Vegetarian Ramen Noodle Bowl means I get to linger and enjoy the food and the people that I’m sharing a bowl with. I’m not really sure, except lingering feels like something Americans don’t do very well. At least, not all the time. Partly because we’re always so rushed. Gratitude gives us a second chance, every day, to renew the freshness of what we’ve been offered in this life. Two years ago, when we sold our home and moved over here for a slower lifestyle, I didn’t really know how it would feel. Stopping the glorification of busy, and reaping the rewards of being surrounded by nature and a more relaxed pace, has been magical for me. I’m so grateful I listened …. 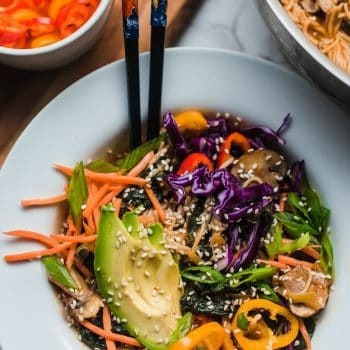 Today, grab some yummy veggies from the market, and rice ramen noodles (we buy Lotus Foods from Costco), and make a heart-warming bowl of goodness to share with someone you enjoy. Or, someone new! Someone you want to savor the time with, and get to know! 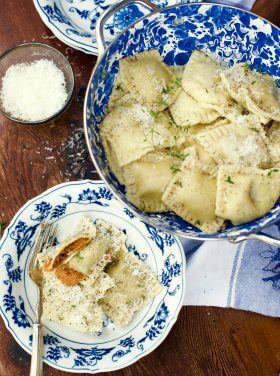 Whatever works for you, you will find this recipe very healthy and heart-warming. In large pot, add avocado oil. When oil is hot, add in leeks and ginger, stirring frequently. Stir until ingredients become golden brown. Reduce heat slightly and add mushrooms. 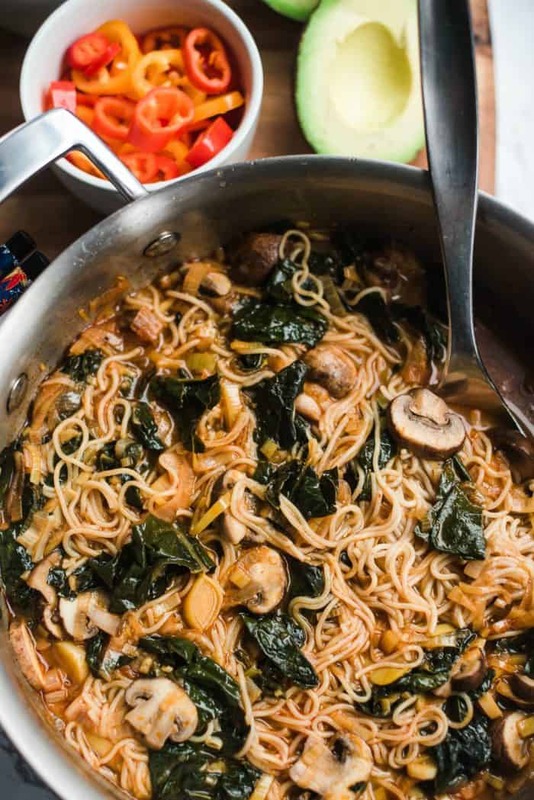 After about 4-6 minutes, when mushrooms are tender, add in broth, vinegar, coconut aminos, curry paste, garlic powder, and salt and pepper. Bring soup to a boil and then reduce heat. Turn to low heat and add noodles. Continue to cook until noodles are el dente—slightly undercooked. 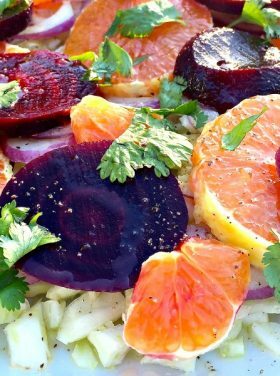 Serve with purple cabbage, carrots, green onion, cilantro, avocado, and sesame seeds. 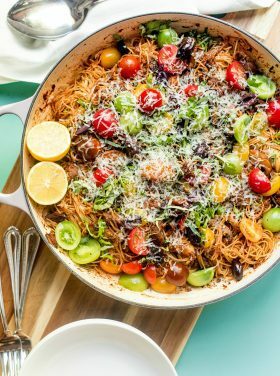 More noodle recipes: Chow Mein Noodles with Chicken [Dinner, Dishes, and Desserts] and Korean Beef Noodle Stir Fry [Fifteen Spatulas]. 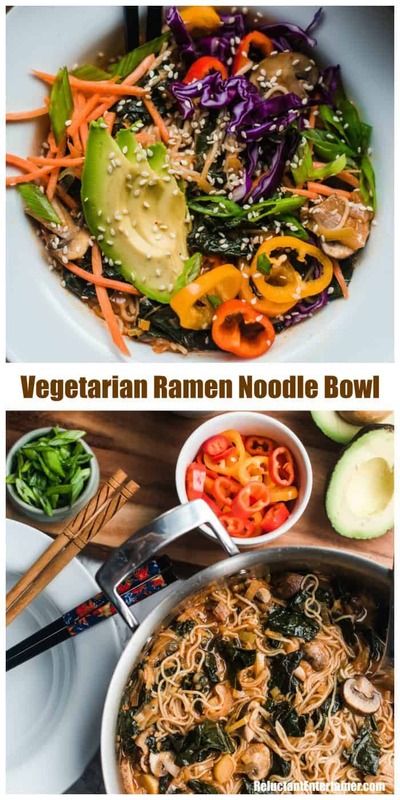 a wonderful recipe, thank you, I love ramen, have never made it before, usually just ordered it, so this is a nice change, even if I’m trying to avoid most pastas!